Get some cultural insight at Chinatown and Singapore Botanic Gardens. Buddha Tooth Relic Temple and Museum and Sri Mariamman Temple will appeal to history buffs. And it doesn't end there: shop like a local with Orchard Road, stroll through Palawan Beach, look for gifts at Keepers: Singapore Designer Collective, and admire nature's wide array of creatures at Singapore Zoo. To see ratings, maps, photos, and more tourist information, you can read our Singapore holiday maker site . Dallas, USA to Singapore is an approximately 24-hour flight. You can also do a combination of car and flight; or do a combination of bus and flight. Traveling from Dallas to Singapore, you'll lose 14 hours due to the time zone difference. Traveling from Dallas in July, expect nights in Singapore to be about the same, around 79°F, while days are little chillier, around 90°F. Finish your sightseeing early on the 14th (Sun) so you can travel to Kuala Lumpur. 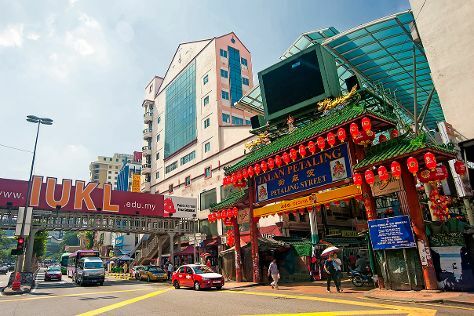 Start off your visit on the 15th (Mon): browse the eclectic array of goods at Chinatown and then explore the fascinating underground world of Batu Caves. For other places to visit, ratings, photos, and tourist information, refer to the Kuala Lumpur trip itinerary site . Traveling by flight from Singapore to Kuala Lumpur takes 3.5 hours. Alternatively, you can drive; or do a combination of bus and flight. In July, plan for daily highs up to 91°F, and evening lows to 76°F. Wrap up your sightseeing on the 15th (Mon) to allow time to travel to Hong Kong. On the 16th (Tue), get in on the family fun at Hong Kong Disneyland. Keep things going the next day: take an in-depth tour of Hong Kong Museum of History, then don't miss a visit to Hong Kong Skyline, and then steep yourself in history at Tian Tan Buddha (Big Buddha). To find photos, where to stay, maps, and other tourist information, refer to the Hong Kong road trip tool . Traveling by flight from Kuala Lumpur to Hong Kong takes 7.5 hours. Alternatively, you can do a combination of flight and ferry; or drive. In July, daytime highs in Hong Kong are 91°F, while nighttime lows are 81°F. On the 18th (Thu), wrap the sightseeing up by early afternoon so you can travel to Ubud. Elephant Safari Park and Wayan's Shop are good opportunities to explore the local culture. Do your shopping at Gallery Ada Garuda and Frenchtoast Premium Factory Outlet. Go for a jaunt from Ubud to Tampaksiring to see Tirta Empul Temple about 36 minutes away. And it doesn't end there: identify plant and animal life at Sacred Monkey Forest Sanctuary, relax and rejuvenate at some of the best spas, explore the fascinating underground world of Elephant Cave Ubud, and stop by La Boheme. To see where to stay, maps, photos, and other tourist information, read Ubud trip itinerary tool . Getting from Hong Kong to Ubud by combination of flight and bus takes about 9.5 hours. Other options: do a combination of ferry, flight, and bus. Expect little chillier temperatures when traveling from Hong Kong in July; daily highs in Ubud reach 84°F and lows reach 76°F. Wrap up your sightseeing on the 21st (Sun) to allow time to drive to Seminyak. On the 22nd (Mon), browse the exhibits of Nacivet Art Gallery, then don't miss a visit to Tanah Lot Temple, and then stop by Makassi. Get ready for a full day of sightseeing on the 23rd (Tue): see some colorful creatures with a scuba or snorkeling tour, browse the exhibits of Nyaman Gallery, then view the masterpieces at Saya Gallery, and finally take in the exciting artwork at Reservoart. To find photos, where to stay, more things to do, and other tourist information, refer to the Seminyak holiday planning site . Seminyak is just a stone's throw from Ubud. In July, daily temperatures in Seminyak can reach 84°F, while at night they dip to 76°F. You'll have a few hours on the 24th (Wed) to wrap things up before traveling home.